The Yurok Country Visitor Center invites you to participate in a traditional Brush Dance demonstration the last 2 Saturdays in May. This presentation, led by our Cultural Coordinator James Gensaw, is a way to continue to pass on the Yurok language, arts, and traditions in the form of song and dance to the greater community. This is also and excellent opportunity for tribal members to learn more about Brush Dance etiquette. Traditionally, the Brush Dance ceremony is performed during the summer months by the Yurok, Hupa, and Karuk Tribes of the Klamath/Trinity watershed, as a curing ceremony for a sick child in the community. 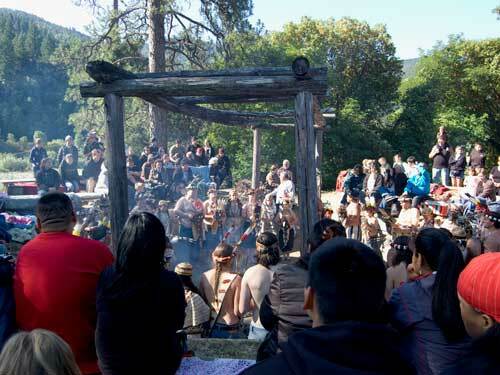 Called mey-lee in Yurok, the Brush Dance is traditionally held around a fire in the central pit of a redwood plank house that has had its roof and walls removed. The dance is somewhat of a social dance where families and villages come together. The demonstrations will begin at 2:00 p.m. on both days and will last approximately 90 minutes. Dance participants will be members of the Yurok Tribe and will need to arrive 30 minutes prior to prepare. The public is welcome to watch the ceremony, to be held outside of the Yurok Country Visitor Center. This video features images taken in the 1950’s of a Yurok brush dance. Merkie Oliver, one of the finest dancers of this era is shown “jumping center” during a brush dance ceremony. Song is sung by Brian D. Tripp, well known artist and traditional singer on the Klamath River.